FILE - A giant Oscar statuette is seen at the 88th Academy Awards Nominees Luncheon in Beverly Hills, Calif. It's one of the most glaring numbers in Academy Awards history. That's how many women have been nominated for best director in the awards' 89 years of existence. Kathryn Bigelow, for The Hurt Locker in 2010, is the only woman to win. "I have to say it really bums me out," says Greta Gerwig, whose solo directorial debut, Lady Bird, opened last week in limited release. "Every year I see the list of people who are in the running for best director. Kathryn Bigelow got in — that's one. Every year they nominate five guys. Every year. And four women have been nominated in the history of the Academy Awards. That's ridiculous. And it pisses me off." 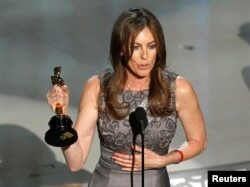 FILE - Kathryn Bigelow, director of "The Hurt Locker," speaks after winning best director during the 82nd Academy Awards in Hollywood, March 7, 2010. Gerwig's sharply observed coming-of-age tale Lady Bird, for one, is among the most acclaimed films of the year. Patty Jenkins' summer sensation Wonder Woman was a runaway hit with both audiences and critics. Next week, Dee Rees will release her Sundance Film Festival hit, the Mississippi period drama Mudbound. Handicapping for March's Academy Awards is early, but each — particularly Gerwig and Lady Bird — is considered among the possible nominees for best picture and for best director. Long before hundreds of women began coming forward with allegations of sexual harassment and assault against Weinstein, director James Toback, producer Brett Ratner and many others, 2017 has been a movie year in many ways defined by female filmmakers. Bigelow, who thought her Oscar win would lead to some industry change, released her powerful race riot docudrama Detroit. Sofia Coppola, one of the four ever nominees (Lina Wertmuller and Jane Campion are the others), became just the second woman to win the directing prize at the Cannes Film Festival (another cinema institution with a poor track record of gender balance) for her point-of-view-flipping Civil War drama The Beguiled. But there have been many more, too, including the astonishing festival selection The Rider by Chloe Zhao (Sony Pictures Classics will release it next year), Angelina Jolie's intimate Cambodian genocide drama (Cambodia's Oscar submission), Rebecca Miller's tender documentary of her father, the playwright Arthur Miller (set to air next year) and Angela Robinson's Wonder Woman origin story Professor Marston and the Wonder Women. It's worth noting that both Detroit and Professor Marston were released by Megan Ellison's Annapurna Pictures, one of the few female-led powerhouse production companies in Hollywood. Robinson, noting the record-setting box office for Jenkins' Wonder Woman (its $821.8 million worldwide gross is the most for a movie directed by a woman) has felt a hint of change is in the air. Rees, whose breakout film Pariah was about a 17-year-old lesbian African-American woman coming to terms with her identity, believes awareness for gender imbalance in the industry has increased but the day-to-day reality is still very much "a work in progress." It's especially fitting that this year has also brought a new film from 89-year-old Agnes Varda, the Belgian-born filmmaking legend who was one of the leading directors of the French New Wave. Her road-trip odyssey Faces Places, co-directed with the street artist JR, took Cannes' documentary award, and it has since ranked among the most celebrated movies of the year. Varda, who will be given an honorary Oscar at this Saturday's Governors Awards, has long been an inspirational figure to generations of female filmmakers who have come after her. The Queen, Gerwig calls her.